I actually almost forgot Finish it Friday! I wrote this whole post and never told you about my Wednesday picture lol... This week's picture is here. It was from my sister's 17th birthday party ARGH! I LOVE themes! Now on to the other scheduled program:: Friendly Friday!!! 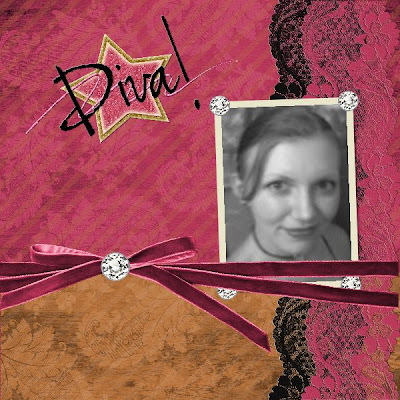 I made it using the Digital Scrapbook Software I am hosting a giveaway for. The giveaway ends 9/8/11!!!! So hurry and sign up to win HERE! So who is that gorgeous lady? A Diva of course. And my Bloggy BFF and a real life BFF too. Cool how that happens. You can see Brittany's endeavors many places! She talks about her Cast and Crew here. I think that is the best place to start to get an idea of who she is, what she believes and stands for and what matters in her life. Now if you haven't been around for a while you might not know that B and I went to high school together. I always thought it was cool she used to go to Stephen King High School (not it's real name, but where he went) and she had actually seen his house. I vividly remember her telling me about how his wife wore pretty dresses and sun hats while gardening among the gargoyles. Anyway... fast forward to her moving and us losing contact, to becoming Facebook friends and us never hanging out. Then I see her doing all types of remodeling and she sees me doing the same. I comment on a local store and I then find out she isnt local anymore. How I missed that ::shurg:: Felt like a shmuck! But now she is back!! And I am really glad I have her to call a friend. We have been hanging out every now and again and her kids are great craft subjects crafters. I enjoy being around them, as they are well behaved and B is a great parent. Soon will be a post about the craft they helped me make. available that will get you $10 off the MyMemories software AND $10 credit to theMyMemories Store.... That's a $20 value for using my promo code! Happy Dance and Disaster adverted!